March is Epilepsy Awareness Month! This year, we’re excited to launch #THEPURPLEDOOR2019 campaign! We invite teachers, parents, students and schools to raise epilepsy awareness in their school board. Submit a photo of your decorated classroom door between March 1st 2019 and March 31st 2019 and be entered in to win a PURPLE DOOR PARTY for your class. With your submission, your class will be entered into a draw. Be sure to share your photo using the hashtag #THEPURPLEDOOR2019 on social media. 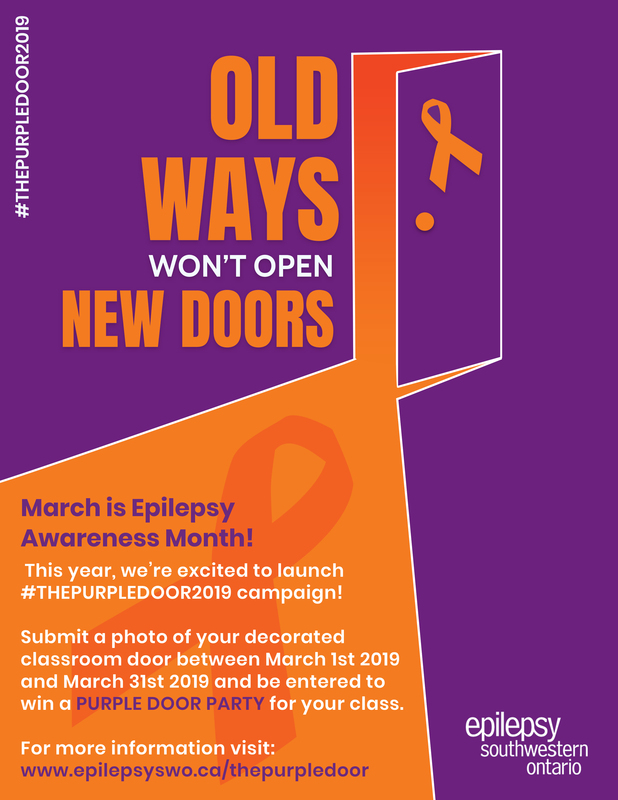 On Thursday, April 4 2019, Epilepsy Southwestern Ontario will announce which class from each school board has been randomly selected for their purple party. The party will include pizza, purple swag and more! Classes or homerooms from both elementary and secondary school boards are invited to participate. With each submission the class will receive an Epilepsy Awareness Month poster and epilepsy fact sheet. Note: If you are unable to decorate a door in your school, consider using a bulletin board or chalk board. For more information, please contact education@epilepsyswo.ca. Book an Epilepsy Awareness Month Thinking About Epilepsy classroom presentation! Epilepsy Southwestern Ontario provides “Thinking About Epilepsy" classroom and school presentations. Presentations educate students about epilepsy and helps make the classroom a more welcoming environment for children living with epilepsy or seizure disorders. The Classroom Presentation will give age appropriate information about the brain, what a seizure is and what to do if someone has a seizure. Depending on the grade level, the presentation will be between 20 and 45 minutes. All presentations require access to a SMARTboard or computer, speakers and data projector. Book with a local educator or by emailing education@epilepsyswo.ca. Presentations offered in Thames Valley and Erie-St. Clair region.